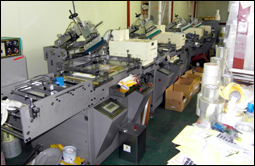 - Screen Printing speed: 1800 ~ 6500 iph depend on print length and thickness puffed print job. 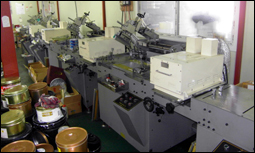 - 4color U.V screen printing units with air-suction system for accuracy material feeding. - Japan AC Servo motor feed unit with digital setting panel system. - Mark Scanning Sensor for 2nd pass job. - It can be control feeding length size adjustment by setter. - 8 U.V. Dryers system(1unit had 2sets of U.V dryers) with control box. 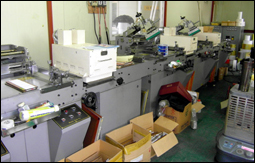 - APPLICATION: Int'l used Sticker Label, PP, PE films for thickness puffed printing job by pop ink, silicone ink, plastic-sol ink.